I like to use the most non-toxic products when I clean, so I often make my own. 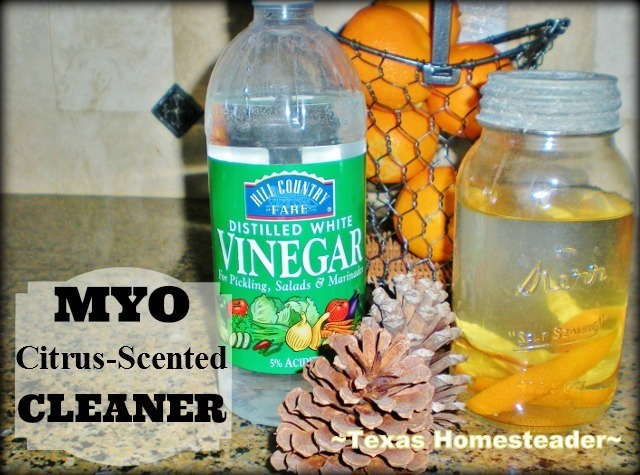 Luckily it’s super easy (and super inexpensive) to make your own cleaners. One of the most common standbys for me is plain distilled vinegar. So inexpensive and such a great cleaner. And I’ve read that its acidity makes it effective at killing many kinds of bacteria and molds, and it’s also a great deodorizer. But RancherMan’s not fond of the smell of vinegar so I typically scent it with something natural. I’ve used rosemary in a jar of vinegar set on our picnic table in the intense summer heat to transfer it’s delightful scent to my vinegar for my Rosemary-Scented Hair Rinse. But today I’m making it citrus scented for cleaning. It was so easy too. You see, each morning I typically enjoy a fresh orange with my breakfast. So I took a quart canning jar and filled it with vinegar. Then I enjoyed my orange, removed the white pith from the back of the peel & dropped the cleaned peel into the vinegar, giving the contents a little swirl. The next morning when I enjoyed my orange I once again removed the pith from the back and dropped the peels into the jar of vinegar, giving the contents a little swirl. Each morning as I enjoyed my orange, I quickly cut the white pith off the back & dropped it into my jar of vinegar, each day swirling the contents to mix it all up. When the jar was full of peels I continued swirling the contents about once every day or so. Over time the color of the vinegar changes from clear to a light orange. After about a week or so of swirling the contents each morning I was able to strain out the peels. And Hocus Pocus the resulting vinegar is now transformed into a powerful citrus-scented cleaner! I like to use this vinegar in a repurposed spray bottle with a tiny squirt of grease-cutting dish liquid. This cleaner works great for removing soap residue on my shower doors – I spray it on & let it sit for about 30 minutes to soften the soap scum. Then I come back & respray, then with a quick scrub and rinse the shower doors are clean. I also use this cleaner in other areas of my bathroom – floor tiles, toilet bowl, and bathtub. It does a great job on all these surfaces. And I’ve been able to take a very inexpensive pantry staple along with a repurposed spray bottle & make it into something useful for my household. This entry was posted in Blog Posts and tagged Environment, Frugality, Make-It-Yourself on January 14, 2014 by Texas Homesteader. Such a great idea. I love the smell of citrus! That’s a great idea; I do clean with vinegar but would prefer to not have such a strong vinegar smell! Pinned. I need to be better about storing our orange peels, we regularly eat them, but we are just composting them. Thanks for sharing on the Waste Less Wednesday Blog Hop! I love this idea and tried it with lemons. Next time I’ll use oranges and thanks for the tip! I have used vinegar, baking soda, and essential oils a LOT for house hold cleaners, but have just not gotten around to making citrus scented cleaners. So, enough procrastinating on my part (read being too busy with other stuff), you have inspired me to take 5 minutes to get this going! Thanks again. Thanks for this! It’s exactly what I’m looking for! What a great idea! Especially since I’m currently sitting next to a pile to orange peels left from my daughter! I think it was meant to me. Anything to neutralize that vinegar smell. Even if the citrus smell starts to fade, I’ll prob just add a drop or two of essential oil. Have a great weekend! I’ve made this cleaner and I love it. After a while the citrus smell faded but the vinegar smell was completely neutralized. Stopping by from Posed Perfection.